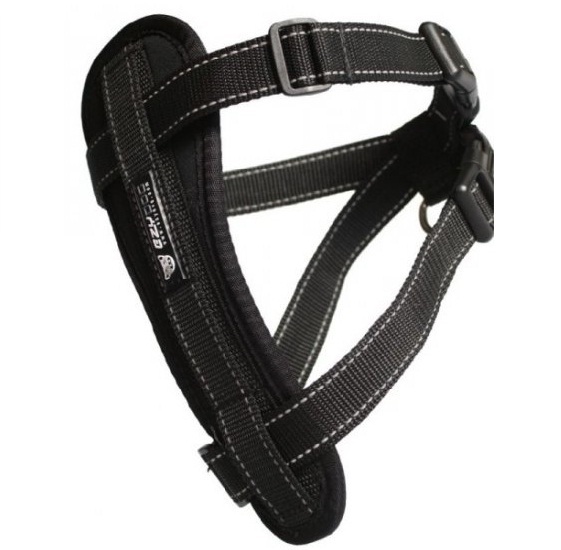 The EzyDog classic harness is one of the most popular harnesses on the market. It has two strong buckles for easy fitting and comfort, each buckle strap is adjustable which makes the harness fit your dog just perfectly. The Black classic harness is our biggest seller, this colour seems to compliment virtually any colour of coat and will give your pet a real sense of fashion. The light reflective tape is very effective at night or in low light conditions and the quick release seat belt attachment will allow you to very quickly attach your dog to the seat belt in the rear of your car - a requirement of the Highway Code. The EzyDog harnesses are made to the highest specification with top quality fittings to give you and your dog years of security, safety and style!